So, Zach Snyder has been announced as director of a Justice League movie following the upcoming Superman sequel featuring Batman, Wonder Woman and now Cyborg. Henry Cavill will be back as The Man of Steel; Ben Affleck was cast as Batman; Gal Gadot, from the Fast & Furious franchise, has been cast as Wonder Woman and Ray Fisher just signed on as Cyborg. Jesse Eisenberg will portray Lex Luthor with Jeremy Irons as Alfred Pennyworth. The currently untitled Superman sequel was originally due July 17th, 2015, but will be released May 6th, 2016. The Justice League film will follow, sometime after 2018. I'm a DC fan. I'm a Batman fan. I like a lot of the other DC characters. I grew up with Adam West as Batman. Michael Keaton and Christian Bale have done a pretty decent job as The Dark Knight. Kevin Conroy is probably THE best Batman - ever. With Diedrich Bader a close second. Growing up with Adam West as the live action "Caped Crusader", there was also the late Olan (Alan) Soule who voiced Batman in cartoons from 1968 to 1984. I think he and Conroy may be tied for how long each has voiced Batman in cartoons. Conroy started in 1992 with Batman: The Animated Series, and with a few exceptions has continued to voice the character to the present. Conroy voiced Batman throughout the Justice League animated series. Although it was not the Classic, original line-up, it was pretty cool, because it was character and story driven. I could live with John Stewart instead of Hal Jordan as Green Lantern; because John was presented as a strong character. It just happened that he was black. The original team was very white-male dominated. That was because ALL of comics were white-male dominated. In a time in America when culture was completely white-male dominated. The comic books just reflected the way the entire country and the entire world was at that time. There was only ONE woman on the team. The animated series swapped out Aquaman with Hawkgirl. Personally, I would have gone with Black Canary instead, as a nod and homage to DC's Golden Age and the previous, legendary Justice Society of America. The animated League was a little alien-heavy for my tastes. A Green Lantern powered by Oa, a Hawkgirl from Thanagar, a Martian Manhunter, a Kryptonian Superman and a Wonder Woman from Themyscira. The only native humans were Bruce Wayne and The Flash, Wally West. The stories were engaging. Justice League: The New Frontier and Justice League: Crisis on Two Earths were great follow-ups to the animated series. In the fall of 2011, DC rebooted re-launched it's entire line. 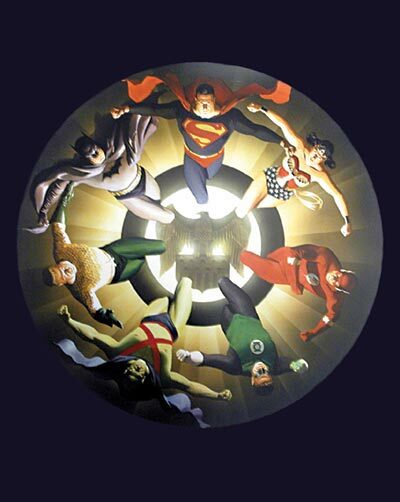 At that time, Justice League was rebooted re-launched. Instead of J'onn J'onzz, the Martian Manhunter, former New Teen Titan Victor Stone, Cyborg, was a part of "The Magnificent Seven". The reason was something along the lines that technology has replaced science fiction. With Green Lantern and Superman, J'onn pretty much got crowded out. J'onn's power set, compared to Superman, kinda made him redundant. Still, he was a founding member. It's a real shame that he was swapped out for Cyborg. I have not seen the animated adaptation of that first Justice League origin storyline, Justice League: War. I don't know how soon I will, either. The animated movie further swaps out Captain (Shazam!) Marvel for Aquaman. Which makes no sense, on the surface, because Captain (Shazam!) Marvel is a one off Superman and a male counterpart of Wonder Woman. 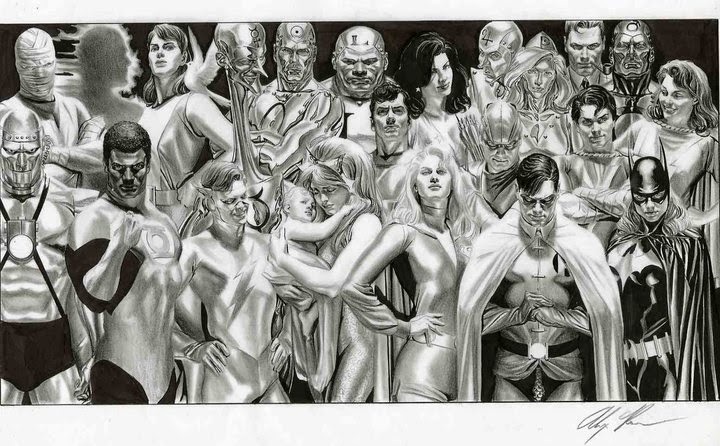 Probably the least complicated is the Paul Dini-Alex Ross JLA: Secret Origins and JLA: Liberty and Justice oversized trade paperbacks. Both were based in The Bronze Age of comics, which was around the time the League moved from the cave headquarters in Happy Harbor to the satellite that was set in geo-synchronous orbit around the Earth at 23,000 miles. If there was going to be a live action Justice League film by Warner Bros., I would suggest instead of trying to directly compete with The Avengers versus Thanos with the Justice League facing Darksied, that Warner Bros. adapt Liberty and Justice. It has a The Andromeda Strain angle to it. A small African village is immobilized by an alien virus and the League must find a cure. What is so cool is that each one of the original Magnificent Seven has their "moment" in the story, but probably the character that carries the whole story is J'onn. A great follow-up to Liberty and Justice, is the twelve-issue Justice by Ross, with Jim Krueger and Doug Braithwaite. I've re-read the three trade paperback collections a number of times. This is the third time I've brought them with me to Kiev. The story never gets old. It feels like a Justice League story, but it is actually an homage to the '70's Super Friends cartoon! There was a Super Friends tie-in comic book to the series that lasted 47 issues, from 1978 to 1981. Some issues have been collected in two trade paperbacks, and a Showcase "phone book" series collection is due in May. Justice is such an enjoyable read. It's a little more mature than a Saturday morning cartoon. The references to the Super Friends cartoon are subtle. Ross, Krueger and Braithwaite don't club the reader over the head with the obvious. It is an enjoyable story. Lex Luthor leads the "Legion of Doom" to the betterment of mankind. Part of the plan is to eliminate the Justice League. One by one the League are taken down. The most powerful elements is that Brainiac kidnaps Aquaman and his infant son, Arthur, Jr.; and Sinestro uses a Boom Tube to send Green Lantern into the unknown. The final act brings in the entire supporting cast of each of the Justice League. It's nice to see the Teen Titans; although it is a little much to see both the Doom Patrol and Metal Men, their roles in the story make sense. The reveal is amazing. The inclusion of The Joker is a bit of a shoe-horn, but it all comes together. There's even a cameo by The Legion of Super-Heroes! Because I enjoy re-reading it again and again, I've brought the three Justice trade paperback collections with me on our third and final trip to Kiev, as creature comforts from home.